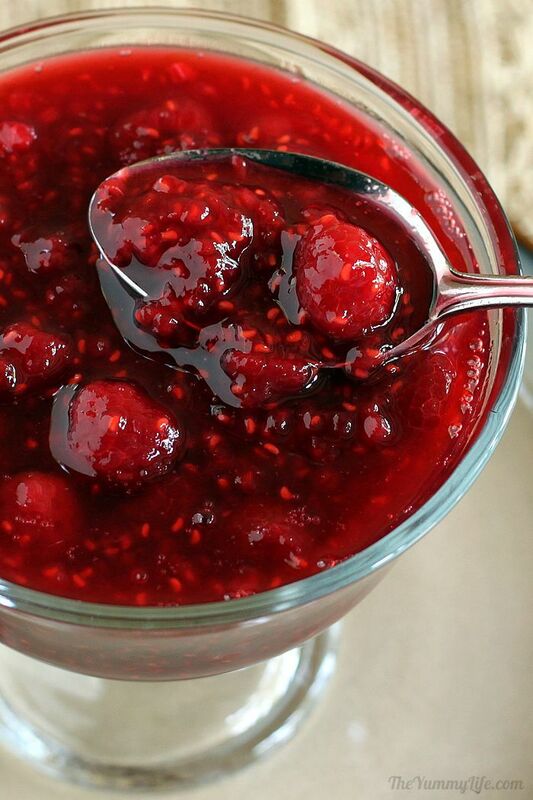 Make this delicious, flavorful sauce in under 10 minutes using fresh or frozen raspberries. 3 simple ingredients are all you need. 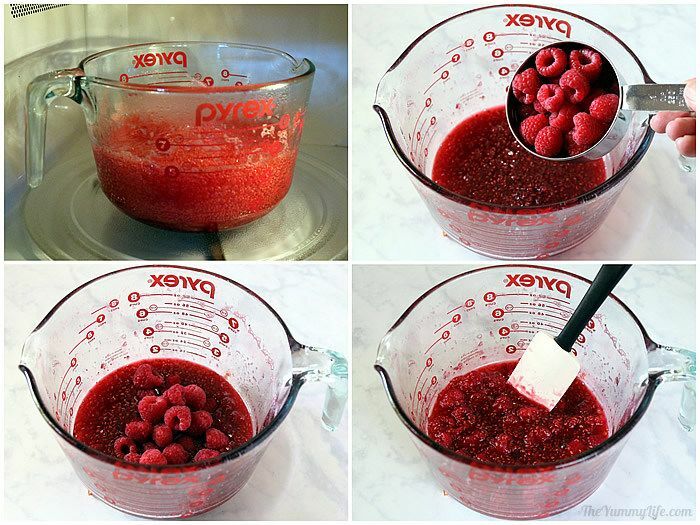 Add 2 cups raspberries to a 2 quart (or larger) microwave-safe bowl; setting aside remaining 1-cup raspberries. 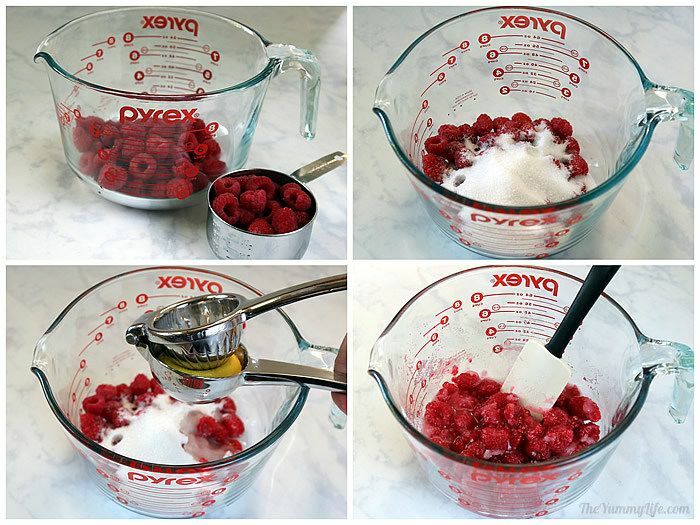 Add sugar and lemon juice to bowl; stir to combine with raspberries. Microwave uncovered at full power for 8 minutes. 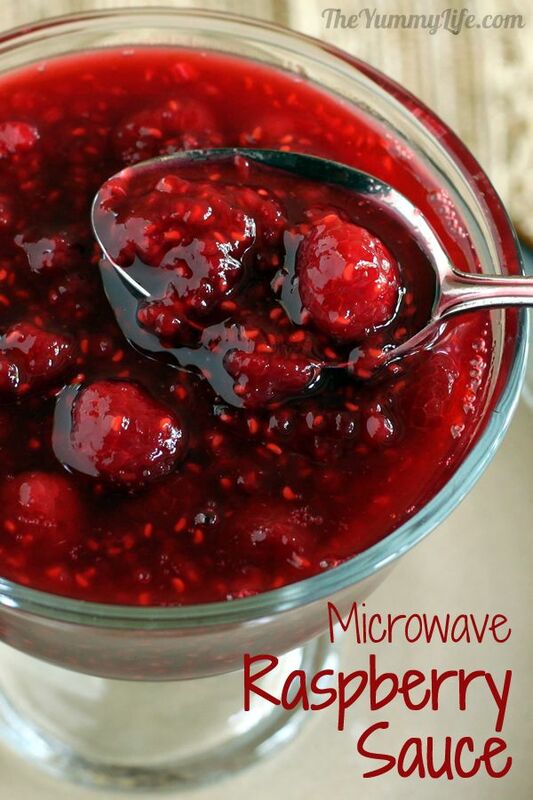 Remove from microwave and stir remaining raspberries into hot mixture just until combined. Cool at room temperature, uncovered, for 30 minutes; sauce will thicken some as it cools. Cover and store in refrigerator. Keeps for at least 1 week. May also be frozen for up to 6 months. Serve over ice cream, cheesecake, angel food cake, pancakes, waffles or toast. --Frozen raspberries are picked at their peak of ripeness and often provide consistently better flavor and deeper color than fresh grocery store raspberries. 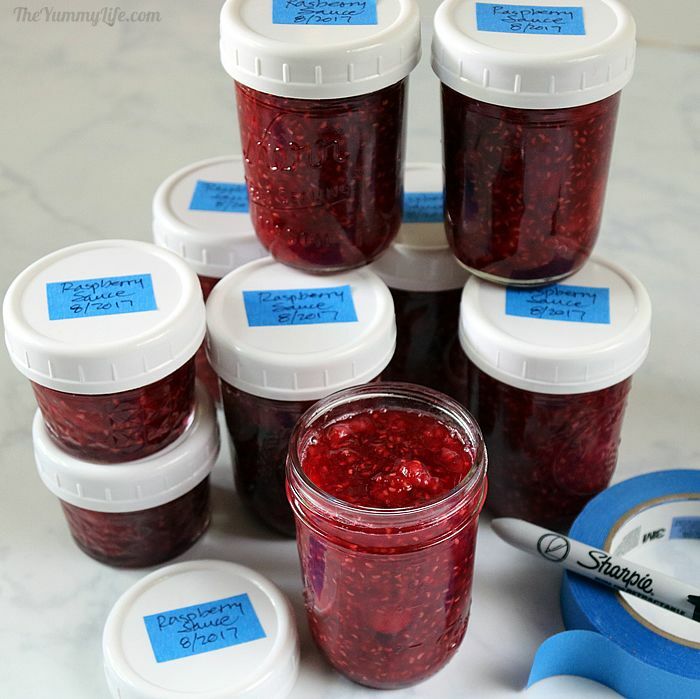 --If using frozen raspberries, they do not need to be thawed before making this sauce. This recipe was originally published 8/2011 and updated 8/2017. This easy, 3-ingredient sauce takes under 10 minutes to make, start-to-finish (plus chill time). It can be refrigerated and eaten within a week or frozen to enjoy throughout the year. It's rustic by design. 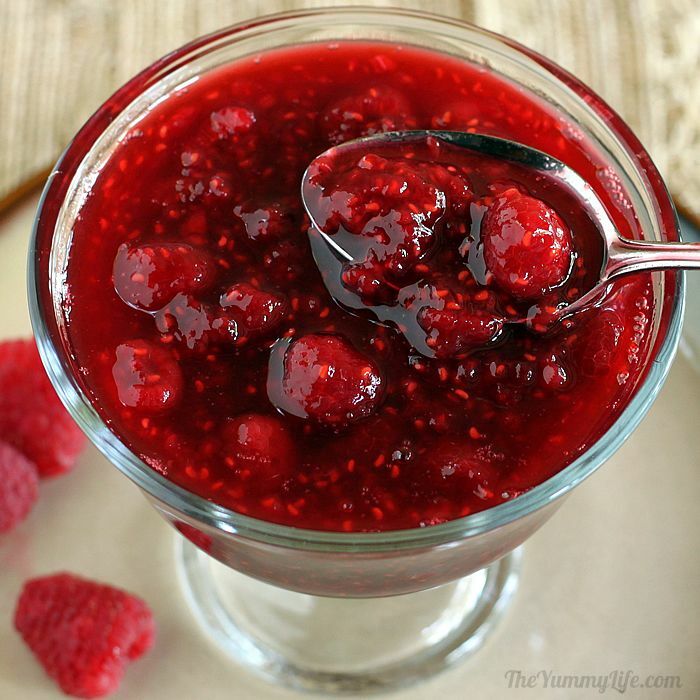 Many raspberry sauce recipes have you strain out the seeds and pulp to make a smooth syrup. I prefer a more rustic sauce with the texture and fiber of the fruit left in. Plus, it's easier this way. But, you can pour it through a metal mesh strainer if you prefer a smoother sauce. Nutritional Information appears at the end of this post, just below the printable recipe. Step 1. 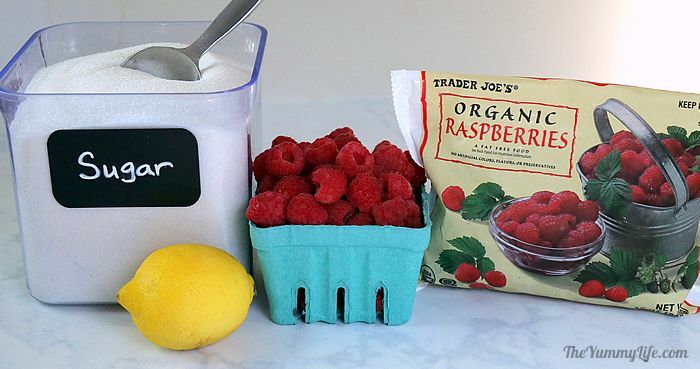 Assemble the ingredients: raspberries (fresh or frozen), sugar, fresh lemon juice. Frozen raspberries are picked at their peak of ripeness and often provide consistently better flavor and deeper color than fresh grocery store raspberries. I choose frozen over fresh, unless I have access to homegrown or vine-ripened fresh raspberries in the summer. 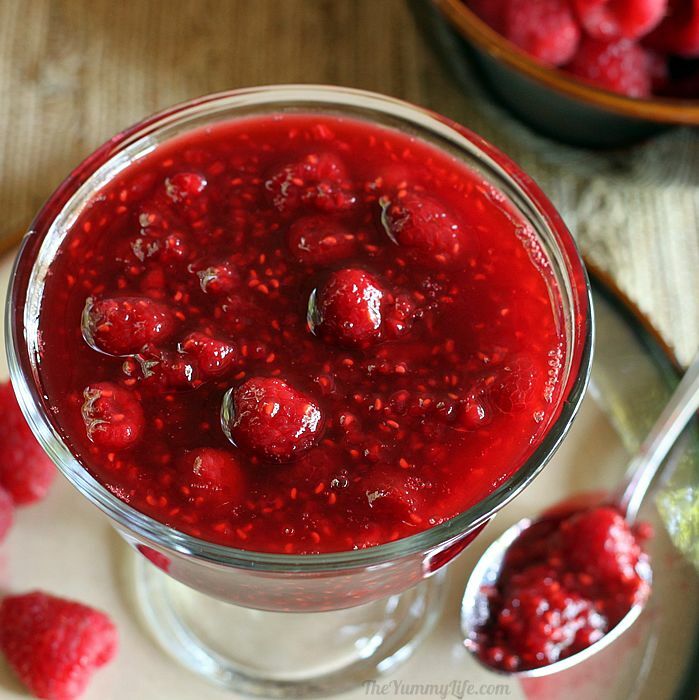 If you're using frozen raspberries, they do not need to be thawed before making this sauce. They'll thaw quickly as they cook in the microwave. Step 4. Add 2 tablespoons of fresh lemon juice. 1 lemon should yield enough juice. Step 5. Give all that a quick stir. Step 6. Microwave, uncovered, at full power for 8 minutes. Step 7. 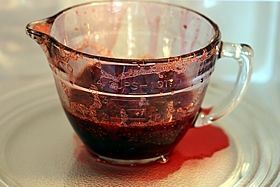 Remove the bowl from the microwave and stir the remaining raspberries into the hot liquid, just until combined. Stirring these whole raspberries in at the end results in a chunkier sauce, because the uncooked ones hold their shape--they cook just slightly while they sit in the hot mixture. Step 8. Let the sauce sit on the counter for 30 minutes uncovered. It will thicken some as it cools. Step 9. Cover and put it in the fridge to cool completely. I store mine in half-pint mason jars. This sauce will keep for up to a week in the fridge. Maybe longer, but ours hasn't lasted long enough to find out. Freeze it! 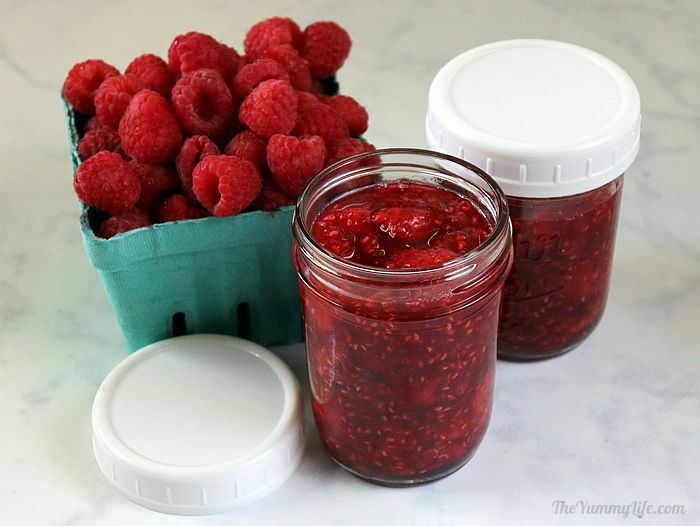 When raspberries are in season, I make up several batches of this easy sauce to freeze and enjoy throughout the year. It only takes 30 minutes to make 3 microwave batches of sauce that yields 6 half-pint jars. They keep in the freezer for at least 6 months. It's such a treat to have this fresh-tasting summer sauce in the middle of winter. To thaw, move it from the freezer to the refrigerator the day before use. For faster thawing outside of the fridge, partially submerge jar in a bowl of cool water. It tastes as good as it looks, it only had 3 ingredients, and you can make it in under 10 minutes--what's not to love about this recipe? This is an updated post that was originally published August 3, 2011.